Sony PlayStation 3 Game published 11 years ago by From Soft. 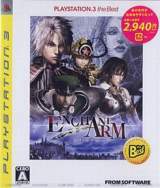 Enchant Arm © 2008 From Soft. Released on July 03, 2008 in Japan.